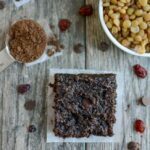 The Chocolate Lentil Bars are a healthy, kid-friendly snack made with just a few simple ingredients. They’re gluten-free, nut-free and dairy-free, perfect for school lunches! Put lentils, oil, eggs, vanilla, maple syrup and sweet potato in a food processor and blend until smooth. Add oats, flaxseed, baking soda and cocoa powder and process until well mixed. Add chocolate chips and craisins and pulse a few times. Press into 9×9 pan lined with parchment paper.